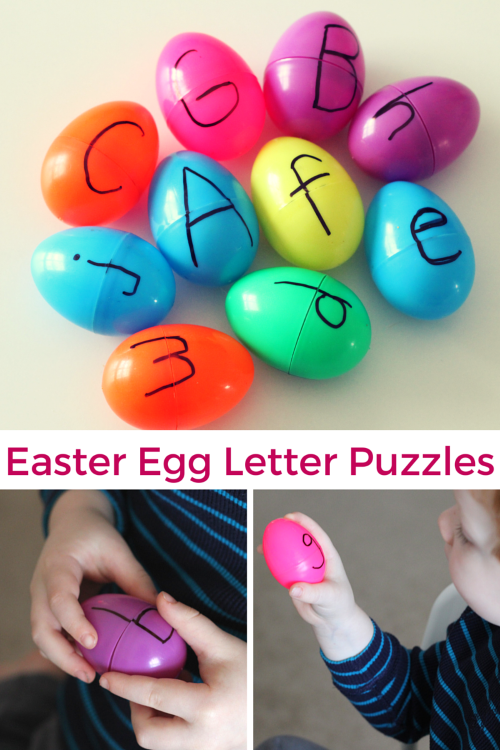 Easter egg letter puzzles are quick and easy to make. 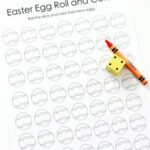 They are an excellent letter learning activity that develops critical thinking and fine motor skills at the same time. My son is a mover. He loves to move and learn. 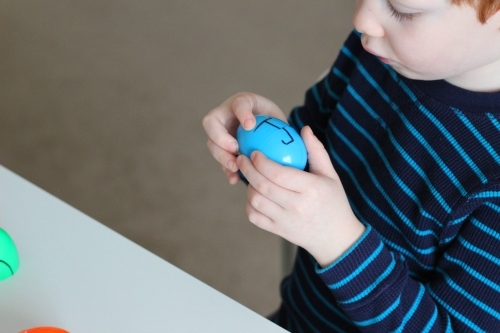 So activities that require him to sit down and focus can be a challenge. However, he loves to do puzzles. I wasn’t sure how he would feel about these puzzles, but he really enjoyed them. He was very focused at finding the correct matches and lining them up correctly and was super proud of himself when he completed one. I was actually quite surprised by how quickly he was able to put them together. 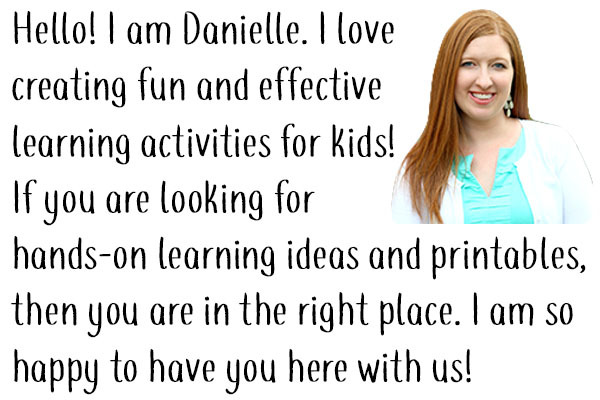 I can really tell that all the letter learning activities we are doing are paying off! 1. 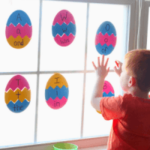 Write the uppercase letter on one side of the egg, Make sure you write the letter large enough to extend across the top and bottom portion of the egg. 2. 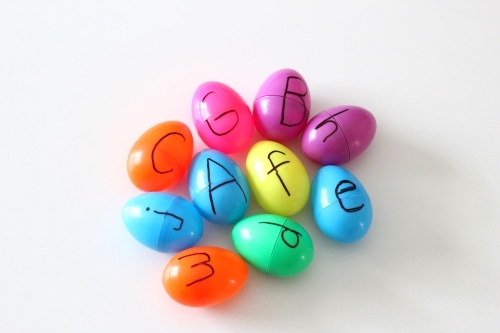 On the opposite side of the egg, write the lowercase letter in the same way; making sure to write it so that extends across the top and bottom of the egg. 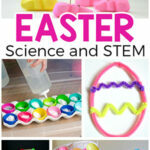 Take apart all of the eggs and put all of the pieces in a pile. 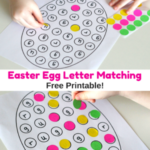 Invite your child to put the eggs back together so that each egg represents a letter and both the lowercase and uppercase version of the letters are correctly aligned. It may help if you show them an example first. My son picked up on what he was supposed to do right away and started putting them all together. 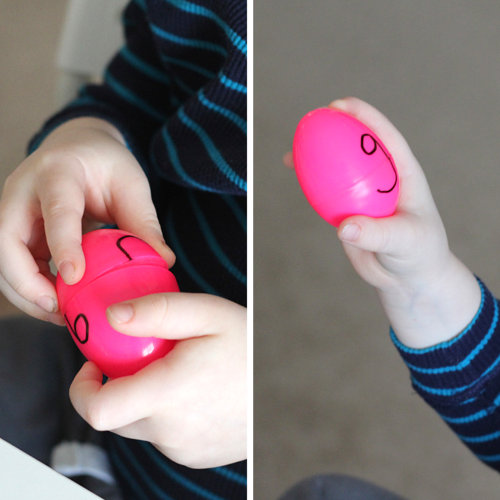 I only used one pink egg and one yellow egg, so those colors were fairly easy for him to figure out, but he still had to work to align them correctly. 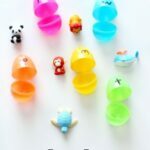 If you wanted to increase the difficulty, you could use different colored egg pieces for the top and the bottom of each egg. 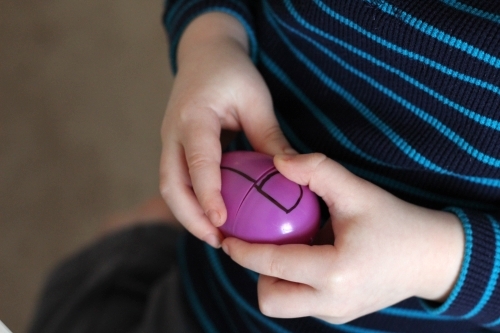 This way egg color would not be an indicator for which pieces go together. I plan to do this when we do the activity again. After they were all together, Evan came up with the idea to hide them from me so I could go on a hunt for them. Then we switched and I hid them and he found them. As we were doing this, I made a point of mentioning the letters by name and even talking about the sounds they make. 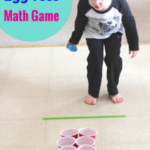 This was a fun way to extend the learning even further!